In October of 2009, Marina Zdobnova attended the Boston Book Festival where Nicholas Negroponte, the founder of OLPC, spoke about the company's mission and demonstrated an XO laptop. 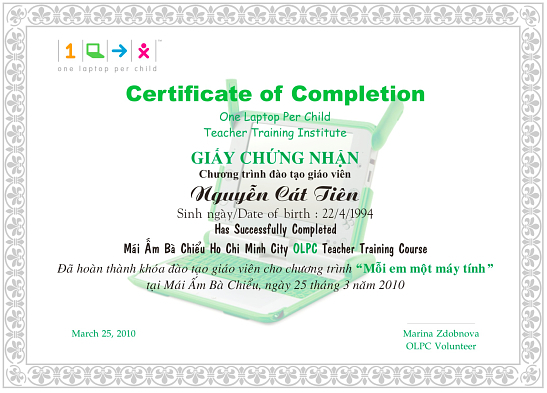 From that chance meeting, Marina had the dream to start an OLPC deployment in Vietnam, and she is succeeding! She is introducing XO laptops as learning tools for children at the Ba Chieu in Ho Chi Minh City, Vietnam, and creating a community of supporters of XO and Sugar users. Now she's been written up in the local press and you can read about her XO exploits as she expands her dream every day. Congratulations to Marina for realizing her dream!